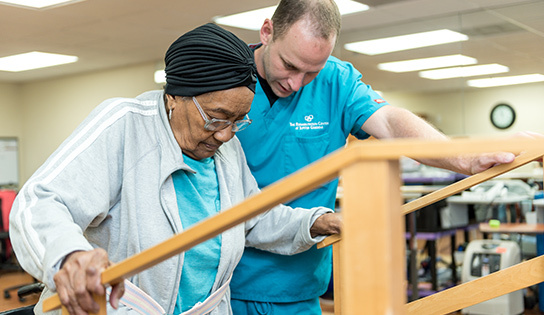 The team would like to shine a light on one of our wonderful residents who has done a spectacular job in our physical therapy department, Ms. Mabel. She is an 89-year-old woman, admitted to Jupiter Healthcare Center on April 10th, 2018, with a diagnosed fracture of the right femur. At the time of evaluation, Mabel was total assistance for bed mobility, transfers, and adult daily living task. This was all due to weakness in her lower extremity with decreased balance. With all of her ailments, we knew that Ms. Mabel had a long road ahead of her; however, we were confident that our team would be able to lead Ms. Mabel back to independent living. We want to thank Mabel for showing us how beautiful the rehabilitation process can be. Her dedication and motivation are a true inspiration to everyone within the community. No matter what the situation is, there is always a light at the end of the tunnel. We are happy to guide her.